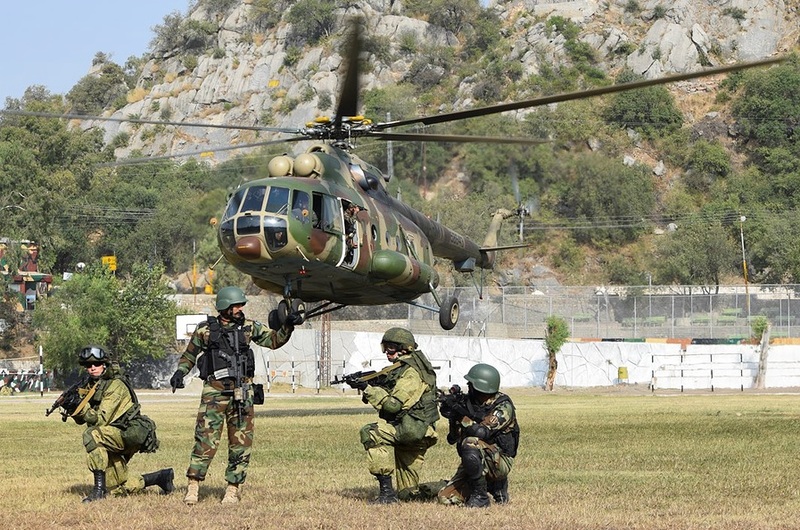 Russian and Pakistani servicemen during Friendship-2016 joint military drills. However there are concerns that these opportunities will only bring short-term gains with no long-term strategic outcomes for both Russia and Pakistan. Unfavourable conditions come in the way of close relations between Russia and Pakistan. Due to uneasy economic situations in both countries they have limited resources for mutual investments and joint business projects. Third countries could also create obstacles for Russia and Pakistan on their way closer to each other. For instance, the United States may try to dissuade Pakistan from strengthening ties with Russia while New Delhi may oppose Moscow’s military cooperation with Islamabad. Russia has consistently been making non-transparent and unpredictable moves towards Pakistan. Under the third president of Russia Dmitry Medvedev (2008-2012) Russia’s policy toward Islamabad was more transparent: The 2008 Foreign Policy Concept declared Pakistan as one of the key regional powers, that Russia intended to develop relations with on bilateral and multilateral levels. Putin's return to the Kremlin in 2012 led to changes in the Russia' policy in South Asia. It seemed to become less clear and predictable. The first indication of this was a short notice cancellation of the Dushanbe Four summit in Islamabad in 2012 due to President Putin's inability to visit Pakistan. Later on, Pakistan disappeared from the Russia's foreign policy concepts of 2013 and 2016. Due to these changes there is a clear lack of understanding of Pakistan's place in Russia's foreign policy became almost absent. The Russian official statements don't reveal any comprehensive strategy in South Asia. For an external observer these moves of Moscow in the region look like separate tactical actions. And what is the most worrisome is that these actions of Moscow may be motivated by external reasons. These could come from Russian relations with the West and its bid for the global role, its interests in Central Asia and the Middle East, and commitments to China. Russia’s recent U-turns in Pakistan occurred in the end of 2016. In November, during the visit to Islamabad of Alexander Bortnikov, director of Federal Security Services, Russia clearly indicated its interest to have access to the Gwadar port and even to “join” the China Pakistan Economic Corridor (CPEC), according to sources in Pakistan. After that the Ministry of Foreign Affairs dismissed any Russian intention regarding CPEC. The recent jump of Russia and Pakistan into the full-scale military cooperation seems to create false perceptions. It gives the appearance of the close and solid relations between both countries. But in fact it camouflages poor economic interdependence, lack of strategy for bilateral cooperation, fragility and reversibility of the achievements of Russia-Pakistan relations. Military cooperation between Russia and Pakistan simultaneously irritates third countries and provokes them to actively spoil a potential partnership between Russia and Pakistan. That is why, instead of boosting bilateral military cooperation, Russia and Pakistan should focus on less visible, but more important fields of partnership, to start with formulating the roadmap for bilateral relations, and facilitating trade between them. The military part of cooperation is also possible too but it needs to be less provocative and visible. It could be limited by arms deals, military education, and bilateral consultations on the issues of mutual concern. As for the war games, they could be embedded into the SCO framework. A trusted partnership with both India and Pakistan is possible only if Russia realizes and articulates their independent value for itself, makes its policy there South Asia-oriented, protects its ties with India and Pakistan from the third countries’ influence, and avoids U-turns and any kind of unpredictability in its regional strategy.